" Director of the Fish Collection at the Naturhistorisches Museum in Vienna "
Johann Jakob Heckel (23 January 1790—1 March 1857) was an Austrian taxidermist, zoologist, and ichthyologist from Mannheim in the Electoral Palatinate. Though not a formally trained zoologist, he worked his way up through the ranks to eventually become the director of the Fish Collection at the Naturhistorisches Museum in Vienna. Not a traveler or explorer like many of the scientists of the time, he remained in Vienna where he studied and catalogued specimens sent to him from the field. 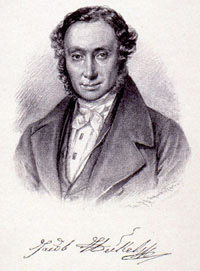 Fish were his speciality and he worked with many of the greatest ichthyologists of his time including Cuvier, Valenciennes, Bonaparte, Müller, and Troschel. He wrote more than 60 works, the most notable of which is "The freshwater fishes of the Austrian Danubian monarchy". He worked on it for more than 24 years but died before its final publication, most likely from bacteria he was exposed to while getting a skeleton from a dead sperm whale.